The new Carte Magique has been introduced by independent retailer trade body OCAN to help its members fight back against online discounters. 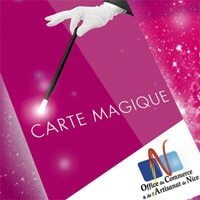 L’Office du Commerce et de l’Artisanat de Nice (OCAN), the trade body which represents the interests of independent retailers in the French city of Nice, has launched Carte Magique, an NFC-based retail loyalty programme designed to increase traffic to local retailers as a whole as well as to allow members to promote their businesses to shoppers. Two hundred retailers have been equipped by OCAN with NFC readers and access to Loyalty Operator, a loyalty platform developed by French NFC and contactless loyalty specialist Adelya. The merchants can use the platform to provide a summary of their products and services as well as to make offers to shoppers, including specific offers on purchases made at their store and points that consumers can collect at all participating retailers and exchange for rewards such as free parking and movie tickets. Carte Magique is available as a contactless card or as an NFC application that consumers can download onto any Cityzi NFC mobile phone. Retailer profiles and details of the latest offers can then be accessed online or via the Loyalty Avenue app on their phone.